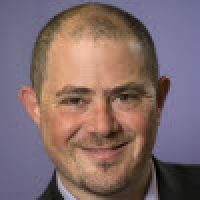 Marketo’s email marketing research team recently looked at hundreds of email sends to examine the relationship between the amount of segmentation used and the level of engagement. 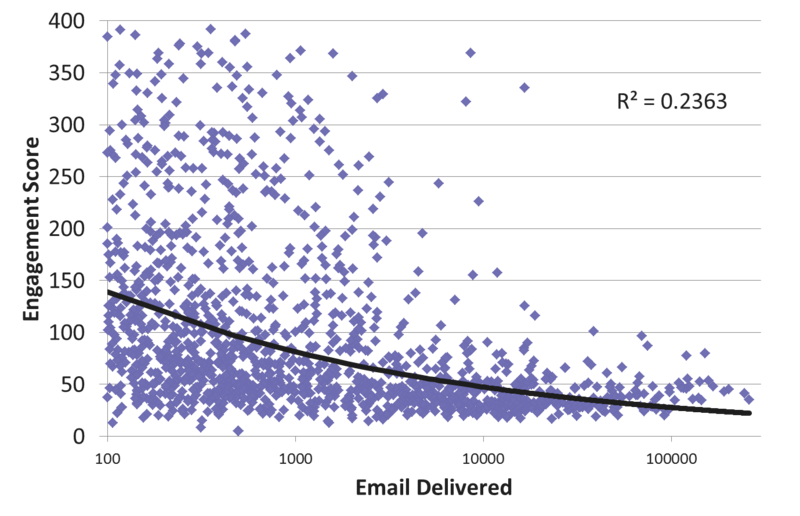 In the chart below, the horizontal axis shows the size of the send, measured by the number of emails delivered as part of a single batch. The vertical axis shows the Engagement Score, a proprietary algorithm our Data Science Team created to determine exactly how engaging each message is. It combines multiple data points — Clicks, Opens, Conversions, Unsubscribes, Program Successes, etc. — and then applies a statistical algorithm to create a single measure of engagement. What we found is quite clear: small, segmented sends are more engaging than large, untargeted sends. More quantitatively inclined readers will notice that the R-squared on this analysis is 0.2363. That essentially means that when looking at how engaging an email send is, 23% can be explained solely by the size of the list! That is pretty amazing (at least to me), especially when I think about all the things that go into an email’s engagement: from name, subject line, copy, design, call to action, and so on. On the other hand, it makes sense. The more focused your segmentation, the more relevant you can be with all those other factors (subject line, etc.). This means you can’t make your emails more engaging simply by chopping up your list into homogenous groups and sending the same email to each. It’s basically impossible to be relevant with a “least common denominator” message sent to a large group – so use targeting to define the natural segments in your list and send uniquely compelling emails to each. 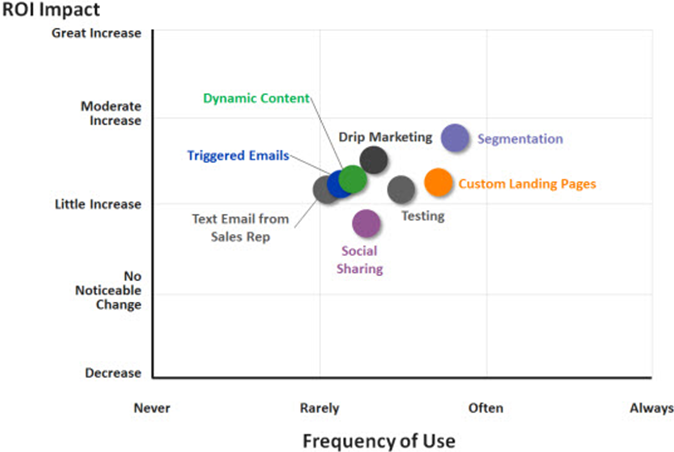 This is why Marketo’s Benchmark on Email Marketing found segmentation to be the highest ROI tactic used by email marketers — higher even than drip marketing or dynamic content. It’s also why Monetate’s Intelligent Email Marketing that Drives Conversions (2012) found that segmented email campaigns produce 30% more opens than undifferentiated messages, and why the DMA National Client Email Report (2013) found that email marketers estimate 30% of email revenue derives from targeting to specific segments. The data is conclusive: the better you segment your email marketing list, the better your engagement and ROI. To learn all about ways to improve your email segmentation, download our free book, The Definitive Guide to Engaging Email Marketing. How are you segmenting your lists? Please let me know in the comments, or on Twitter using the hashtag #DG2EEM.